Before, throughout and after the most recent #eltchat, many burning questions emerged in my mind. The topic of the chat was How to teach writing. Based on my experience, teaching writing is not exactly popular with most EFL teachers. I don't think that it's primarily because teachers find it off-putting to correct written assignments; I suspect the reason may be that most teachers really don't know how to teach writing effectively. Personally, I have no problem with speaking, listening or reading. I think I can prepare a meaningful lesson focusing on any of the three skills. When it comes down to writing though, I don't feel so confident. Is it because in real life, I do more speaking, listening and reading and so I find it easier and more natural to teach these skills in L2? I wouldn't say I'm a totally inexperienced writer, though; I've been writing this blog for some time now, and I think I have some idea of how difficult it is to produce a cohesive and coherent piece of text. I have a huge advantage, however. I can write whatever I want and whenever I wish. The problem is that at school, students are permanently asked to write about topics prescribed by the teachers or the curricula. Write an opinion essay about technology and how it can affect people's lives, write a report about an accident you've recently had, etc. Sometimes we let our students choose the topic, but I dare say that it doesn't happen very often. And they definitely have to write when the teacher tells them. Although I too struggle with teaching writing, I think I've done a couple of simple activities which proved quite effective, especially when done repeatedly and frequently. For example, I ask Ss to describe and compare random pictures in pairs and later on, when they've had plenty of time to prepare, I get them to do the same in writing. Over time, I've seen some great improvements in my students' basic written production. My students have improved their grammar tremendously (verb agreement, plural, the present continuous, prepositions, there is/are, articles, stative verbs), vocabulary (clothes, colours, verbs for actions, adverbs of place, linking devices), but they've also polished their style (for example, they know it's best to start with the general and continue towards the more specific). By asking Ss to write their descriptions down, I encourage them to recycle vocabulary and focus on the language they use in speaking naturally and fluently, but in which they often tend to make mistakes. 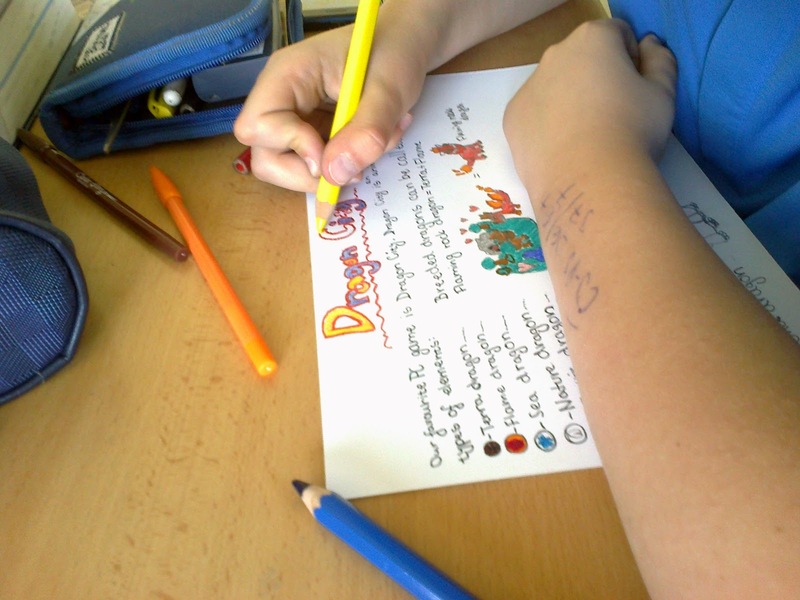 This activity is something between controlled practice and free practice; Ss are free to write about anything they like but obviously, they're restricted by the content of the prompts – the images. To be completely honest, I don't think L2 learners should be given too much freedom in writing up to a certain level of proficiency, say intermediate. It's great when Ss can express their ideas and get their message across. The trouble is that they are fond of using their self-invented idioms and collocations, usually directly translated from L1, and when these fossilize, it's difficult to get rid of them. That's why I think learners should practise using ready-made chunks and fixed phrases, rather than let their fantasy unwind too much at the early stages of learning the language. I think it's best the teach Ss paraphrase and summarize (or, alternatively, elaborate) first, and only later let them create their own, unique pieces of writing. A) Gradual elaboration: 1) Ask Ss to listen to the easiest (simplified) version of the authentic news item, i.e. Level 1. This is very short so I'll use it as a dictation. 2) Play the more difficult version, including more details and more advanced vocabulary, which may be pre-taught if necessary. 3) Ask Ss to re-write the first version, i.e. they elaborate on it from memory, using more detail and more advanced vocabulary. 4) Play the Level 3 version - the original one - just the video, no sound. Allow Ss to make any changes again. 5) Play the video with the sound on. Let Ss add more information to their texts. 6) Ask Ss to write up and submit the final draft. B) The backward alternative of the activity; summarizing and paraphrasing: 1) Show the original video, sound off. Ss guess what happened. 2) Show the video again, this time with sound on. Ss try to get a grasp of the general meaning of the news item. 3) Play level 2 and finally level 1 (just audio, no video available). Thus I'll make sure that even the weakest students know what the news item is about. 4) Ask Ss to write a summary of the news item. I hope that the overlap of visual and verbal memory with their previous knowledge will help Ss to produce the text, but they will probably produce different texts, based on their level of proficiency and writing skills. The weakest students will come up with some basic vocabulary and grammar, while more advanced learners, having caught more advanced structures, will write up a more elaborate summary. This may be perfect for mixed-ability classes. Subsequently, I'll definitely include some vocabulary practice, because I believe it's primarily extensive vocabulary that makes good writers.